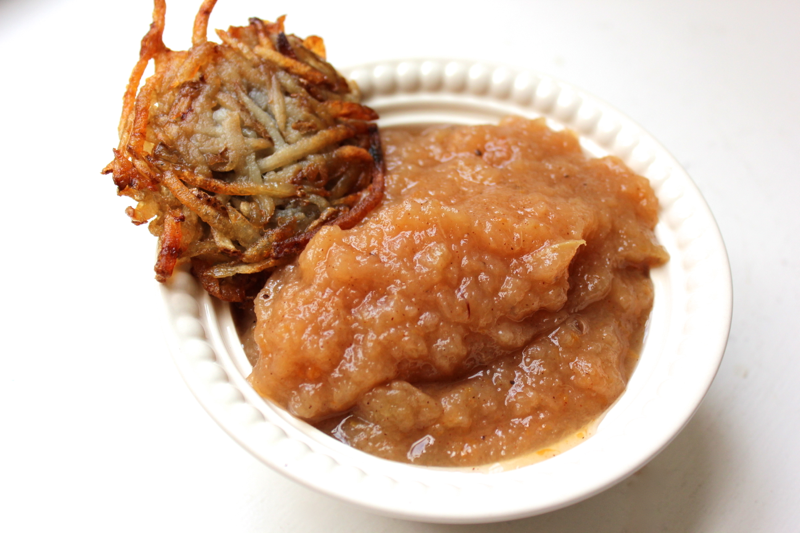 I can’t decide whether I prefer this gloriously citrused applesauce warm from the oven or cold from the fridge, but I am certain that I love it spooned alongside some golden, crispy potato latkes. I couldn’t resist, and you shouldn’t either. Besides, making applesauce is a wonderful and relatively hands-free way to use up at least 3 of your possibly 27.5 pounds of freshly picked apples. Spiced with cinnamon and allspice (the allspice marries perfectly with the citrus), this applesauce is a wonder to behold (reference, anyone?). Especially considering that the baked apples whisk into a sauce of the most perfect consistency, and without the slightest whisper of a “blender” or “food processor,” this recipe is a true fall wonder. 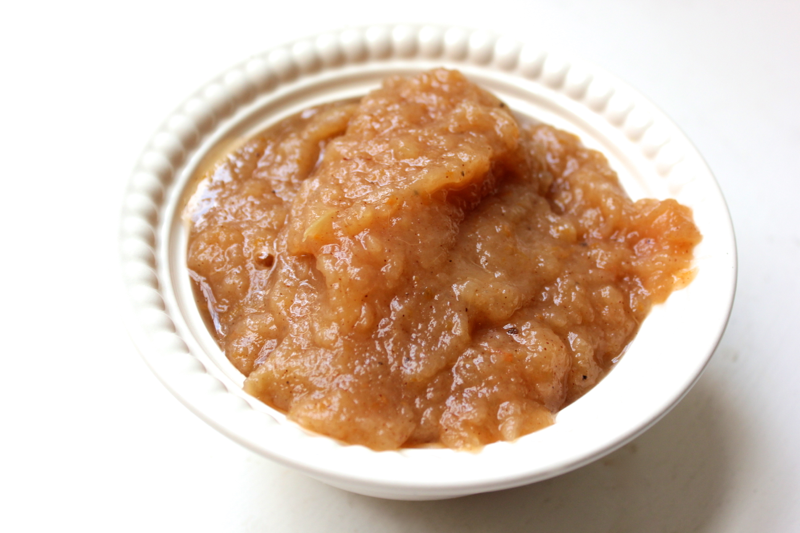 To make this applesauce, get a medium sized, oven-proof pot with a lid. To the pot, add the zest and juice from 1 orange and 1/2 lemon. 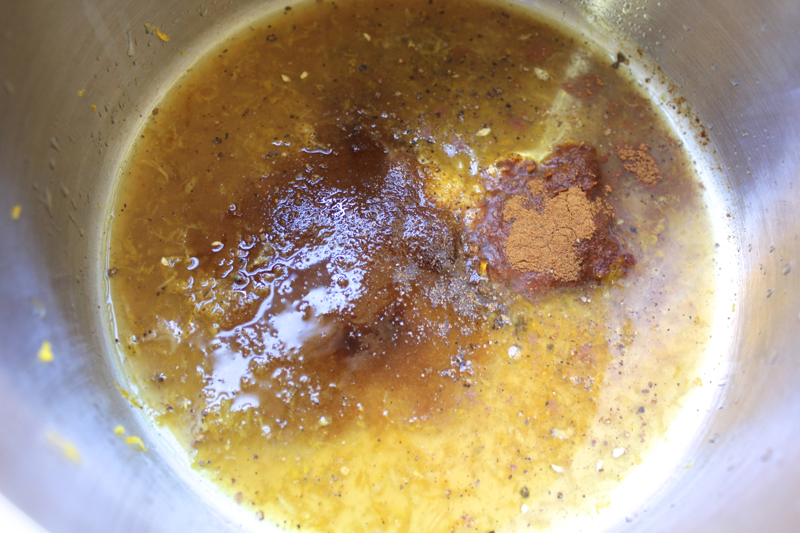 Add in 1/4 cup of brown sugar, 1 teaspoon of ground cinnamon, and 1/4 teaspoon of ground allspice. I really love the allspice. Preheat your oven to 350º F. Then, get 3 pounds of apples, whatever variety you prefer. Peel the apples, cut them in half, remove the seeds and stems, and then cut the apple halves into 4 wedges each. 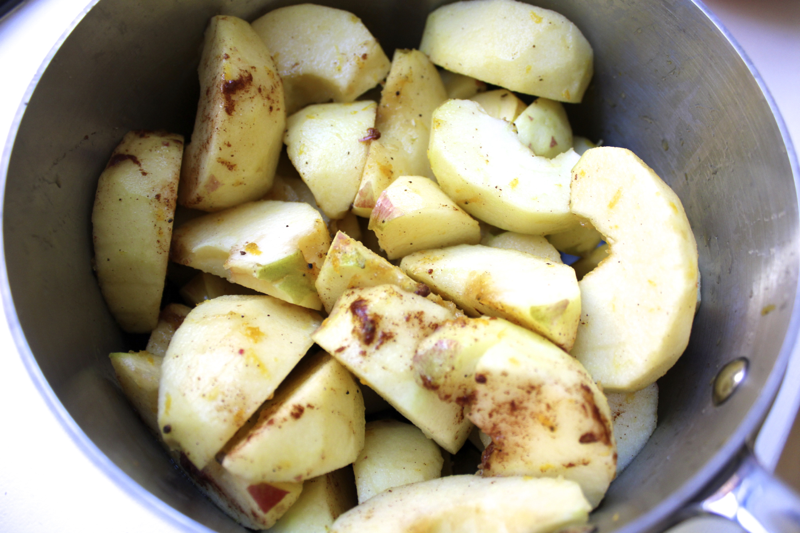 Add the apples to the pot, and toss them around to coat them in the citrus juice and spices. Pop the lid on the pot, and put the pot into the oven. Let it cook for 1.5 hours. I was really looking forward to the smell of cooked apples fragrancing my apartment, but I didn’t pick up on the glorious smell until 1 hour into the cooking time, so don’t despair, it will come! 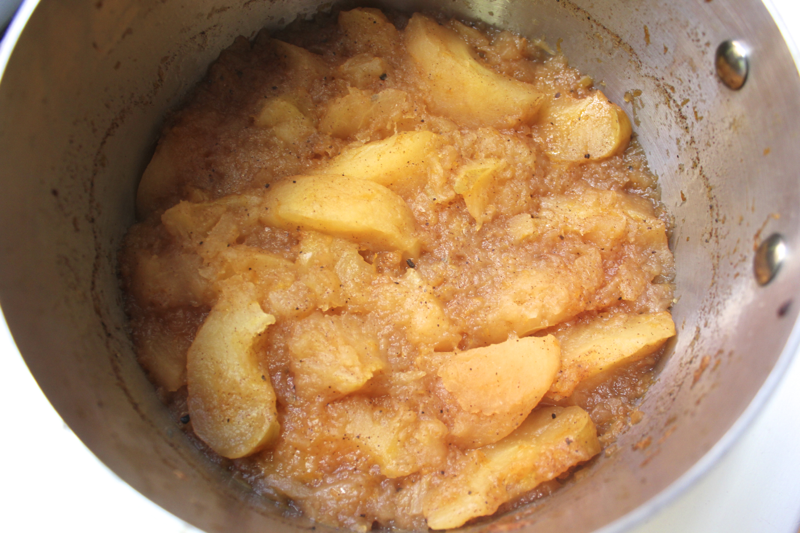 After the cooking time is up, the apples should be completely soft, reduced, and thickened up. 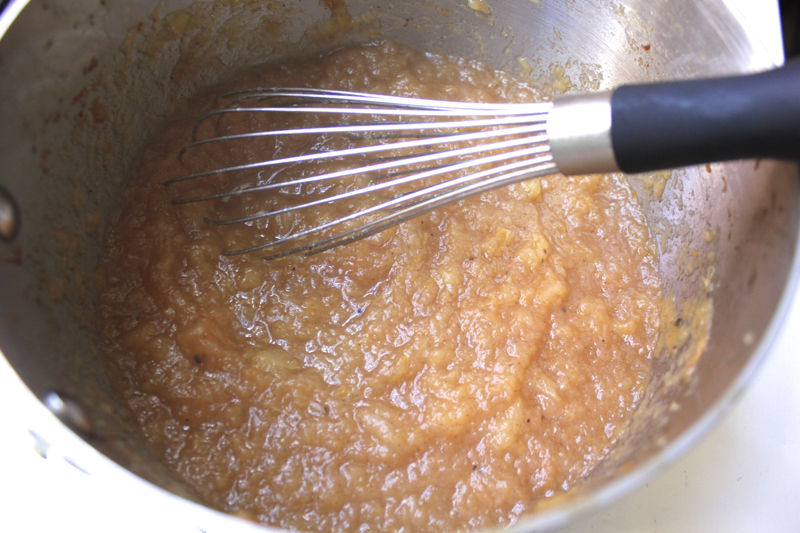 Stick a whisk in the pot, and stir the apples until they purée themselves into a beautiful sauce. I was shocked at how effortless the whisking was, and it made the sauce into the perfect consistency. Not watery, and nicely textured with very small apple bits. The apple sauce really is delicious both warm and cold. I made a batch of potato latkes especially to eat with the applesauce, but I also go through a lot of applesauce when I make my granola bar bites. The flavorful applesauce will add a whole other component to them, and I can’t wait to try it out. I hope you love this applesauce as much as we do…it would be hard not to! 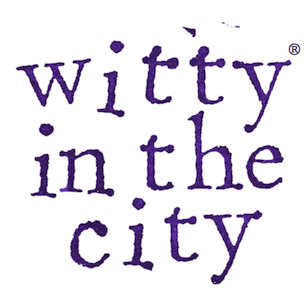 This recipe is adapted from Ina Garten.